So I've been having a problem. I'm stuck at the beginning of the level, I know that the gate is suppose to open up. I press the plate at the door and supposedly I'm suppose to go left and find the second switch under the plank, well, there is no switch. I looked everywhere and I can't find it, what do I do? Sorry for the delay! Did you get past this? 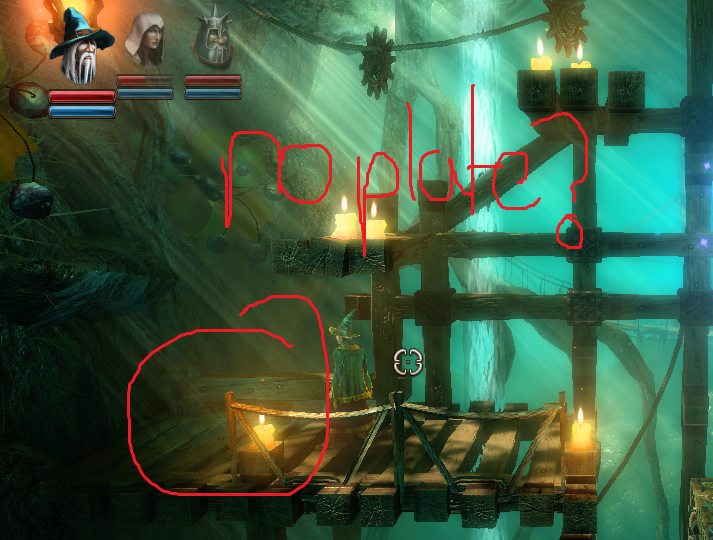 The issue here probably is that the Enchanted Edition have some differences in some of the puzzles compared to the original Trine. Did you happen to compare the game to that version? To give you a hint there should be two buttons at this location, the one at the bottom and one at top right. Let me know if you need more help. If this is the case, please also mention if you have the Steam or other version of the game. Cheers!